A number of speciality futurities took place this week in Conyers, GA. during the Georgia On My Mind combo of the HQHA Stock Show and Pro Am Circuit that’s still underway. The Grand Prix arena served as the setting for the National Quarter Horse League Huntfield Derbies. The High Derby saw Hannah Bedwell and Two Lucky Minutes take the win and receive a check for $520. The Reserve Championship was a tie between Lauren Patterson with Afternoon Your Honor for Phebe Brennan and Jessica Johnson with ATM for Morgan Graham. Both teams received $195. Third place was also a tie between Lauren Patterson with Art Smart for Taylor Dahl and Lee Paul Shinn with Metallic Iron for Chester Prince. Both teams received $130. Fourth place was Hannah Bedwell with Desert Party, winning $130. Hannah’s partner for the win was an 8-year-old gelding she calls “Griffin,” who’s by Lucky Lucky Zip and out of Do You Have My Sock. 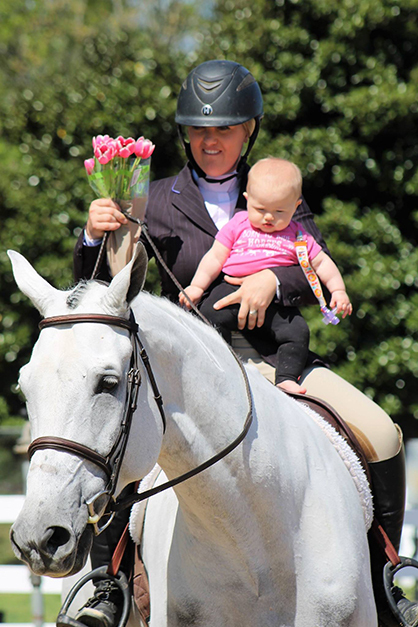 They’ve been a team for the past three years, but this is only his second year in the show pen. Following this win, Hannah plans to continue campaigning Griffin in Huntfield Derbies and at the AQHA World Show in Over Fence classes. 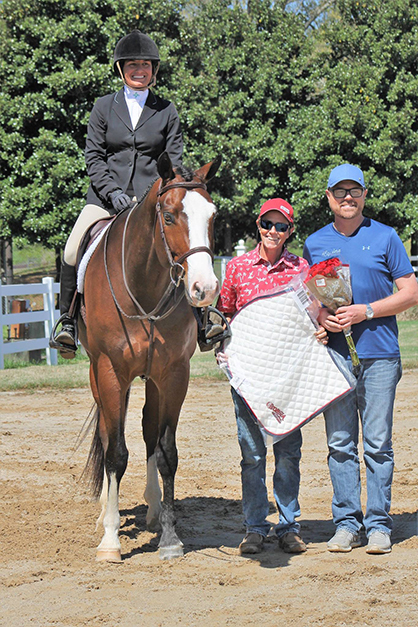 In the Low Derby, Jessica Johnson rode DGS Vintage to a win for Robin DeGraff. They received $260 for the win. The Reserve Champion was Taylor Haney with Un Forgettab Lee for Laura Grotenhuis, winning $195. Third place was Tyler Haney with Al Amaze You for Jennifer Clark, winning $130. Fourth place was Lauren Patterson with Ohh M G for Taylor Dahl, winning $65. Fifth was Taylor Dahl with Art Smart. Sixth was Jessica Johnson with Cloaked In Honor for Madison Scheiner. In the $10,000 Kim Rich Memorial Green Western Pleasure, Katy Jo Zuidema rode Knockin It Out to win $3,811.40 for Kathryn Frederick. 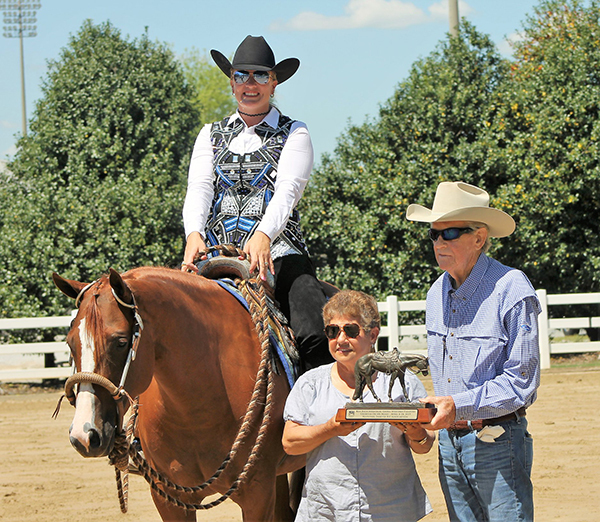 The Reserve Champion was Amanda Jackson with Mr Freeze, who won $3,026.70 for Looney Quarter Horses, LLC. Third place was Tim Zuidema with Shootin The Breeze, winning $2,242 for Kathryn Frederick. Fourth place was Cole Baker with Invite Royalty, winning $1,121 for Sally Bannon. Fifth was Kelby Hutchinson with Don’t Know Don’t Care, winning $1,508 for Capall Creek Farm, LLC. Sixth was Jason English with Shes A Cool Gal for Stanley and Susan Scott. There was a tie for seventh place between Carmen Mayabb with Shes A Perfect Storm for Janice Warford and Dustin Millsap with Shesaezrockingoodbar for Mac McGinnis. Ninth place was Jay Starnes with Only N A Lexus for William Dean Oliver. Tenth was EH Pait with Shez A Hot Moonlight for Amy Black. Eleventh was Dillion Frank Vaughn with Velvet Rush for Amy Brosch. Stay tuned to EquineChronicle.com for complete results coming at the show’s conclusion on Monday.